According to legend, the Palacio was originally a stop on the Military Line of the Pony Express, then re-built as an Art Gallery. It is now Converted to a Getaway For Groups that want LOTS of elbow room in a sprawling 7000 square feet. The South Gallery is 34 feet long, the Main gallery even larger. There is the Palacio (main house), the Casita (guest house), Seven (7) fireplaces, and five(5) courtyards. Send the kids to the North Gallery / Bunk Room and they will be in a world of their own, all the way across the Main Gallery. The Master Bedroom has its own fireplace and lounge, which is larger than most living rooms at 20 x 20. The Dining Room has its own fireplace for cozy meals, or just to gather. The Pantry can handle meal preparation for large groups, and serves out to the Dining room. The eat-in Kitchen has room to serve an informal meal and its own fireplace. The Guest House has its own bathroom, kitchenette, fireplace, living, study and bedroom. It is separately entered across the inner courtyard from the main house. 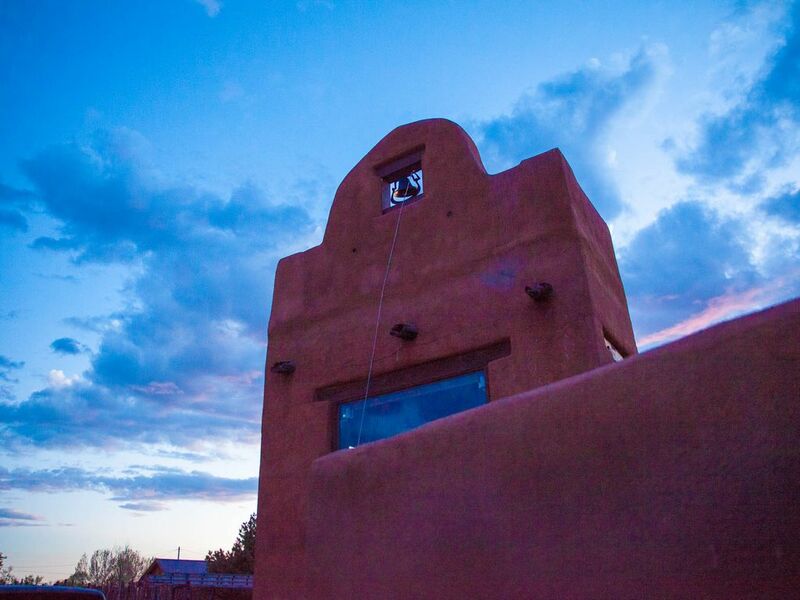 There is no other house like it in Taos. The Palacio is conveniently located near Arroyo Seco on the paved and plowed Ski Valley Road. Beds, futons and couches sleep 20 or more. With the optional Guest House, a total of 5 bedrooms and 4 baths will accommodate a large party; the guest house alone is sufficient for a small family or couple. ABOUT PETS-- We are making the Palacio open to pets, but pet owners must be responsible. Pets are allowed in designated areas and are NOT ALLOWED on furniture, rugs or carpets. The pet fee is $300, but $250 will be refunded if the housekeeper confirms there are no pet damage or pet hairs left behind. NOTE: The Palacio is mostly located on one ground floor, but includes numerous "changes of level" (also known as "steps") when passing from room to room. Please be alert and aware, and step up or down when passing a change of level. See, for example, the photo of the Foyer, which looks out over the Main Gallery below. Only a miracle (combined with a lot of elbow grease) made it possible for us to own the Palacio. As shown in this picture, we have re-plumbed and massively renovated the property. I'm good with a pick and shovel and my wife has good taste and knows southwest art and design. We are committed to making the Palacio a place where guests can find their own miracles. The Palacio was originally built by an artist who was also a contractor and a pilot. It was his gallery. It adjoins the Taos Indian Reservation lands and stands in the lee of El Salto and the "Magic Mountain". Now we are remaking it into a place where groups can spend a few days, a week or a month taking in the magic of Taos. The main house has beds and bedrooms for 12 and sleeping room for up to 20. The separate guest house has its own bathroom, kitchenette, bedroom and study with sleeping space for another 6 people. The guest house is available at a discount to guests in the main house, or at a reduced first-season rate to smaller parties. Beams, latillas, woodwork, adobe and plaster all set the stage for the quintessential Taos experience, but the huge rooms give the Palacio a magnificence that is not found elsewhere. The building makes me feel expansive and lets my mind roam. Bring your art or music and be creative here. Or sit back and enjoy life in a palatial space. Incoming and Local calls are included at (575) 776-8272. In addition to the 7 fireplaces, there is a forced air furnace and hot water baseboard heat. NOTE that the North Bunk Room and East Bedroom rely on heat from the Main Gallery and are cooler. There are 7 fireplaces in the Main Gallery, Media Room/South Gallery, Dining Room, Master Lounge, Kitchen, West Bedroom and Guest Living Room. Off street parking is sufficient for 4-6 cars, and on-street parking is available for more. For special events, we can open the North Forty which parks about 15 more vehicles. A carport provides covered parking for 1 or 2 cars. Fireplace inserts are in the fireplaces in the Main Gallery, Media Room and West Bedroom. Dining room is set up with one dining table but can be extended into the South Gallery with up to three more tables to seat up to 24. 65" flat screen in Media Room, 40" flat screen in Master Lounge. 12 miles to Taos Ski Valley on paved roads. The Palacio's Masseuse is an experienced certified professional masseuse who can arrange house calls and has a studio nearby. Overall, nice place for a large group. Enjoyed the Taos area. Could be improved by cleaning up some of the junk in the backyard. Good point about the cleanup! Spring is here and spring cleanup starts this week. We will also be doing some improvements in the West Yard along the acequia, and the bridge to the island. The West Yard is slated to become BBQ central this summer. No more junk allowed to accumulate. We were able to have four families enjoy the space. Perfect distance from the slopes and town. Kids enjoyed the ping pong table and plenty of space for all to unwind after a long day. Perfect space for larger parties. Plenty of areas to spread out and multiple bedrooms. All areas were clean and well cared for. Lots of towels and everything you need in the kitchen. Games and books for entertainment. Close to Taos ski area and the town of Taos. We had a wonderful time and would stay again. The house is large and beautiful. It had everything we needed...even down comforters! Will definitly stay here again! This home was perfect for our family of 14. So much area to be together or break up in smaller groups. The location was perfect for those wanting to go skiing as it was just a short drive up the mountain. The owner was so quick to respond to any questions I had. Would definitely rent this home again if returning to Taos. PET NOTE: A $250 portion of the pet fee will be refunded if the pets do not cause damage and leave no pet hairs behind for the housekeeper, resulting in pet charge of only $50. GUEST HOUSE Note: The optional Guest House is available for $100 PER NIGHT for main house guests, reduced from the regular rate of $150 per night. To book it, or to book only the Guest House, contact Linc by email or phone. If you aren't booking the guest house, the guest house may be used by owner or other guests.